UR INTEREST IN BROMELIADS was awakened and developed by David Barry's and Victoria Padilla's collection about seven years ago. When we opened our nursery over three years ago, we featured bromeliads, and our collection has grown as our nursery has progressed. It has been very enjoyable introducing our favorite family of plants to our customers and seeing the excitement and enthusiasm awakened in them as it did with us. I don't mean that this appreciation is shared by all. There are the "do likes" and the "don't likes," but not many "in-betweens." The "don't likes" usually voice their disinterest by saying "How odd!" They may also ask, "Is that a cactus?" Then I'm inclined to surmise that a cactus is not one of their favorite plants; otherwise they would know that it wasn't a cactus. For the last two years we have entered an exhibit in the San Diego County Fair at Del Mar, California. We chose the Indoor Plant Display Class because of our bromeliads and were wise in this choice because we were awarded the blue ribbon both years. An amusing story emerged this past year at the Fair. 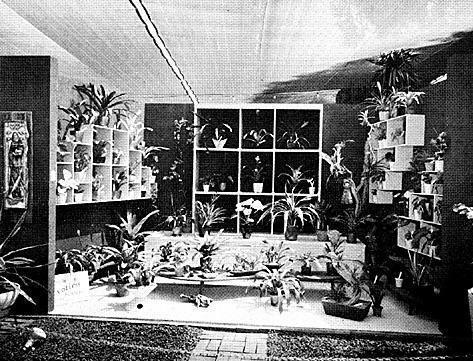 Our exhibit had a mass planting of Neoregelia carolinae var. tricolor in bloom as the foreground planting. A member of The Bromeliad Society over heard two women discussing the Neoregelias. They were certain the red color had been painted on the leaves and were wondering how it had been done. The next day a customer came into the store and told a similar story. We have been accused of using a paint brush! AST YEAR, in the Costa Rican highlands, I found five nests of the pretty Flame-throated Warbler (Vermivora gutturalis), a bird confined to the high mountains of southern Central America, about whose breeding habits scarcely anything was known. Two of the nests were in quite similar situations, on thick horizontal branches high above the ground, between two tank bromeliads whose broad leaves interlocked above them, forming a green roof that seemed adequate to shed the rain that was so frequent in the nesting season. The third nest was built in the top of a small tree at the forest's edge, amid a greater variety of epiphytes, including bromeliads, mosses, and lichens. The remaining two nests, surprisingly enough, were set in deep nooks amid the grass that thickly covered vertical banks beside old, sunken cowpaths in the pastures. All five of the nests were in sites that provided overhead protection, whether by the strap-like leaves of bromeliads or densely matted grass. This seemed significant, as the nest of the Flame-throated Warbler, a bulky pile of mosses and liverworts with a mixture of fibrous materials in the inner layers, is open above. The other wood warblers resident in the wet Costa Rican mountains, species of Myioborus and Basileuterus, build roofed, oven-shaped nests with a door-way in the side, usually placing them on banks. One of the abundant birds of these mountains is the Common Bush-Tanager (Chlorospingus ophthalmicus) a small, olive-green bird with a prominent white spot behind each dark eye. It was surprising to find this tanager selecting the same unexpectedly great range of nest sites as the wood warbler. Two of the bush-tanager's nests that I found last year were beneath epiphytic bromeliads whose leaves formed a roof above the mossy open cup. In one case, the protecting plant was a narrow-leafed Tillandsia; in the other, a broad-leafed tank bromeliad. Three other nests of the bush-tanager were set amid dense grass, two of them on low banks beside cow-paths and one on the ground in a hillside pasture. In earlier years, I had found nests of this little tanager imbedded in the thick coat of moss on the trunks and branches of trees. One of these nests was beneath a tank bromeliad. Less often than selecting bromeliads for the roof of their nest, I have found birds using these plants for their nest's foundation. In the Costa Rican mountains, long ago, I discovered a nest of Gray's Thrush (Turdus grayi) set amid the stiff, dry, outer leaves of a small tank bromeliad attached to a trunk. By choosing such a well-enclosed situation, the bird saved herself much work; her nest had about the thinnest walls of any thrush's nest that I have ever seen. In it lay three blue eggs mottled with brown, excellently concealed by the profusion of ferns, mosses, shrubs, and other epiphytes among which the bromeliad grew. A pineapple plant in my garden provided a firm support for the slight nest of a Ruddy Ground-Dove (Columbigallina talpacoti). The bromeliads so abundant in tropical America, from the coasts up to, and even above, timberline on the high mountains, offer nectar to the numerous humming-birds, which seem to be the chief pollinators of some species; and from their seed pods these plants provide down for the hummingbirds' softly padded nests. They also form aerial bird-baths. While walking along the woodland's edge one drizzly afternoon, I met a party of Velvety Antwrens (Microrhopias quixensis), consisting of two males and a female. Presently the pretty, chestnut-breasted female dropped down into the water that had collected at the base of one of the broad leaves of the tank bromeliad and took a bath. After she finished, a black male performed his ablutions in the same little pool. Then, repeating their low, mournful chirps, the trio flew back into the woods. Although birds often benefit by the presence of bromeliads, only rarely do they injure the plants. But one day, in the Costa Rican mountains, I saw a Streaked-breasted Tree-hunter (Thripadectes rufobrunneus), a stout brownish member of the Furnariidae or oven bird family, tearing and tugging at the narrow leaves of a tank bromeliad, often pulling away large pieces and dropping them to the ground. After I had watched, greatly puzzled, for about five minutes, the bird revealed the purpose of this strenuous activity: it extracted from among the bases of the leaves a small frog, which it promptly carried to the ground, doubtless to devour. In the wooded regions of tropical America, the bromeliads, numerous and attractive as they are, nearly always remain a minor element in the heavy vegetation and are of only occasional service to the abundant birds. But in the high Andes of Peru above 12,000 feet, where trees are rare or absent, gigantic terrestrial bromeliads of the genus Puya are locally a conspicuous feature of the bleak landscape and contribute importantly to the lives of some of the birds that flourish in this harsh environment. In 1957, Jean Dorst, of the Museum Nationale d'Histoire Naturelle of Paris, published in The Ibis (Vol. 99, p. 594-599), the journal of the British Ornithologists' Union, an interesting paper on "The Puya Stands of the Peruvian High Plateau as a Bird Habitat." In scattered localities in central and southern Peru, P. raimondii grows in small pure stands, in which the older plants attain a height of about ten yards when bearing their huge, terminal inflorescences containing innumerable greenish white flowers. Amid the clustered, sword-like leaves, birds from sparrows to doves take shelter from diurnal storms of rain or hail and sleep at night. The puyas also offer nest sites that are fairly immune to predators, and Dr. Dorst found as many as 14 nests of several species in one plant. Hummingbirds hide their cup-shaped nests within the old dead leaves that drape around the thick stem; Black-winged Spine-tails (Asthenes d'orbignyi) build their great covered nests among the living leaves near the top of the plant, where they are visible from a distance. Unhappily, the puya is not without danger to the birds that it shelters. The leaves bear on their edges, especially toward the base, large, sharp, incurved spines; and sometimes the birds, doubtless chiefly when they are disturbed and try to make a hasty departure, impale themselves on these hooks. Their struggles to free themselves only force the spines deeper into their flesh, and they are held captive until they die. As many as ten mummified corpses, chiefly of doves, were found in a single plant, and scarcely any puya was without them. One who has rashly pushed far into a dense stand of wild pineapple (Aechmea magdalenae) of the humid lowlands and then tried to escape, will appreciate the plight of these poor birds. — El Quizarrá San Isidro del General. Costa Rica. ECHMEA SERRATA IS NOT ONLY very rarely seen in cultivation, but it is also seldom found growing in its place of origin. It is native to the French islands of Guadeloupe and Martinique in the Caribbean Sea, where it grows epiphytically on certain trees at altitudes between 30 to 600 meters or 90 to 1,800 feet. It may possibly be found in other West Indian islands. This species was discovered in 1753 by P. Plumier, who gave it the name of Bromelia ramosa & racemosa foliis arundinaceis serratis (Plantarum Americanarum, p. 53, pl. 64, 1775). Various others have given this bromeliad other names: Tillandsia serrata, Linne; Caraguata serrata, Roemer & Schultes; Platystachys plumieri, Beer; Aechmea plumieri, Baker; Caragate dentee, Lamarck; and Aechmea serrate. Mez. 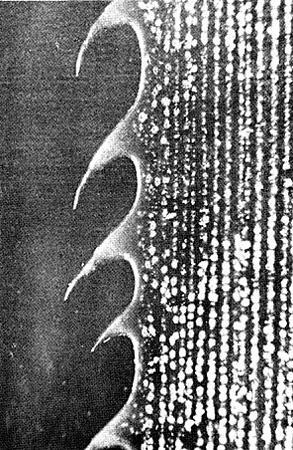 The name serrata comes from the Latin term serratus, which means dentate or toothed like a saw. The leaves are edged with dark reddish-brown sharp teeth, which are about 2 millimeters or 1/12th of an inch long. These teeth are separated from each other by a distance of approximately 1 to 9 m.m. 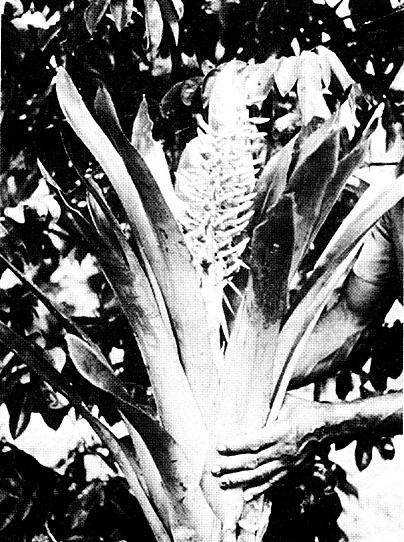 The leaves of Aechmea serrata are large, their length measuring usually 60 cm. or two feet. If the plant were to receive regular feeding and careful culture it probably would assume much greater proportions. As can be noted from the accompanying photograph, the leaves are fairly rigid. The leaves are covered with white scales which are placed in parallel rows like thin silvered lines following the length of their support. These scales, which are more numerous on the under side of the leaf than on the upper, are necessary for the well being of the plant, for they absorb the humidity from the air as well as derive nourishment from dust and other particles that might fall on them. The illustration showing the closeup of these scales shows them magnified about nine times. The flower spike is 60 centimeters or two feet high and presents a harmonious combination of pink and green shades lasting long before the first flower starts to open. The paniculate inflorescence has a diameter of 13 c.m. or 5 inches and a height of 25 c.m. or 10 inches. Each raceme is a compound of 6 to 8 (rarely 9) flowers. At their base is a slightly pendent bract; there are other bracts along the stem practically hiding it. The coloration of the bracts is a mixture of pink and green, edged with white hairs. The blossom starts from the base, and each morning for two full months, three to seven flowers open with dark violet petals and a violet stigma surrounded by white stamens. A blossom lasting two months seems a record indeed! The fruits increase in size during the 5 or 6 months which are necessary to ripen them, during which time their coloration turns to a deep violet, lasting for weeks and weeks in this showy condition. During this time offshoots develop for the perpetuation of the species. A detailed description with drawings of Aechmea serrata was published in the Revue Horticole de France for the year 1907, page 129. The described plant which was in flower fifty eight years ago differs from the ones we now have by its smaller dimensions and its different bracts. This old plant had been imported from La Martinique, but was lost during the war because of lack of heating in the greenhouses. The ones we have now come from La Guadeloupe. We are trying to get a new importation from Martinique in order to compare the two plants in case there may be two varieties of this Aechmea. As to cultivation, we keep the seedlings in a hot greenhouse and give the adult plants a minimum temperature of 17° C or 62° F. A compost of oak or beech mold leaves may be used, but we prefer our usual orchid compost in which are mixed one third each of osmunda, polypodium roots, and sphagnum moss. The plants do best in filtered sunlight. Aechmea serrata is a very showy, beautiful plant and is one that will lend itself to modern indoor decoration. Because of its long blooming season it is certainly a desirable plant. It is our hope to get some even more striking specimens through hybridization. — 1 Rue de l'Eglise, Boissy Saint Leger, France. BROMELIAD SEED FUND — Mrs. Mabel Goerth, 3207 Debbie Drive, Orlando, Florida writes that due to illness, she had to discontinue her activities as seed chairman for a time. However, she is now eager to get going again, but she needs fresh seeds to sell or to exchange. Will all those who have any surplus seed please send it on to Mrs. Goerth, so that this important aspect of our Society's activities can be both successful and beneficial. Some of the scale insects that are pests on bromeliads attack plants of other families as well. I have found that a soft brown scale from my bromeliads will transfer to Clivia, and is considerably more difficult to remove from this latter host as it becomes firmly embedded in the leaf tissue. Even in the early stages it takes a knife-tip to lift it out; later, a hole completely through the leaf results. On bromeliads the attachment is just to the surface; rubbing with a thumb readily effects the removal. — Roger K. Taylor, 3122 Calvert St., Baltimore 18, Md. S EVERY BROMELIAD ENTHUSIAST KNOWS, many bromeliads have modified leaf bases that collect and hold water. I think that is a safe factual statement that cannot provoke argument. Yet I have been led to wonder if the explanation everyone "knows" for this phenomenon is correct, namely, that these are reservoirs to tide the plant over droughts. This theory has been discussed in no less a place than Scientific American, as an example of evolutionary opportunism. It is generally agreed that the tanks allowed the early xerophytic bromeliads to with-stand drying out, and thus opened up a new environment, the tree tops, to their descendants. Yet there are a number of facts that do not support this, I feel. If the water is primarily intended for internal use, why aren't there feeder roots? We know that organisms can adapt beautifully to their environment, yet the tank epiphytes are hard to justify on grounds of efficiency: A closed tank, similar to Aechmea setigera and some forms of A. bracteata would resist evaporation far better than the open, shallow, multiple water reservoirs found in most genera. Since the trans-formation merely involves bending the leaves up, there must be a good reason why it has rarely occurred. Actually, I have never understood what advantage an open water reservoir has. Swollen stems, as in orchids or cacti, flashy leaves as in Kalanchoe and Aloe, or bulbs and tubers as in many plants, are surely far better ways to conserve water. Then there is the serious problem of why the tanks are best developed in the areas where they seem to be needed least! The great "tubs" of Glomeropitcairnias, on their rain drenched islands, the water loving Nidulariums, such as N. innocentii var. lineatum, and especially the profusion of tank plants along the Brazilian coastal mountains, do not seem to match the usual explanation. The diversity of genera and species is greater in this last area than anywhere else in the family's range. I do not want to deny that drying out can occur even in cloud-forests, nor that the water tanks help bromeliads survive as house plants. But many plants without specialized water-storage survive the limited drought that sometimes hits the cloud-forest, and the house plant issue is irrelevant, since bromeliads did not evolve in such an environment. It is also true that if you keep the water dumped out of the cups most bromeliads will wither and dry up. But this proves only what the eye could see in the first place, that the tissues down in the water are soft and delicate. If they are suddenly exposed, the plant will lose water through them. I will agree that bromeliads can take in water through these same tissues. I will also agree that they do so. But the question remains, is this a lucky secondary function of the tanks, or was it the primary function for which they evolved? If ants, beetles, roaches, etc., steel the pollen and honey from a flower, the chances of reproducing the species are diminished. This is related to a well-known fact about bees, that they continue visiting flowers like the one that has just rewarded them, even if other colors or kinds of flowers are present in large numbers. It is likely that nectaries on leaves or peduncles, hairy or bristly (inferior) ovaries, and the water catching bracts of Strelitziaceae serve to stop robber insects from walking up to the flowers. While the leaf bases of bromeliads usually touch, it seems possible that some insects will become lost or discouraged in the "watery maze". For those who make their way through, the inflorescence itself is often surrounded by a solid ring of water. The extreme form of this occurs in Neoregelia, Nidularium, and Guzmania sanguinea, where the short inflorescence is submerged except for the flowers themselves. The inflorescence is often scurfy, sticky, or variously "booby-trapped" against ants. And the climax of all this is seen in those bizarre Guzmanias that surround the flowerhead in jelly. Several people have noticed that the orchid genus Elleanthus has some species that also have jelly-filled inflorescences and that the color, general size and form is like these Guzmanias. Furthermore, they grow in the same places. I have never heard of any good explanation of the jelly, except as a small insect trap to protect the hummingbird pollinated flowers. Unfortunately, we know very little about the pollinators of bromeliads. Butterflies, moths, and bats seem to be indicated. Whether bees, flies, or beetles should be added to the list, I cannot say. I would like to know if Cryptanthus might be ant pollinated. And does the giant hummingbird (Patagona) really sit on the branches of Puya berteroniana and reach into the flower as has been suggested? Whether my idea on the significance of waterholding in this family is confirmed or discredited, it might focus attention on the interesting animal-plant relationship I have just hinted at, and help us learn more about them. —736 Myrtle Way So., St. Petersburg, Florida. 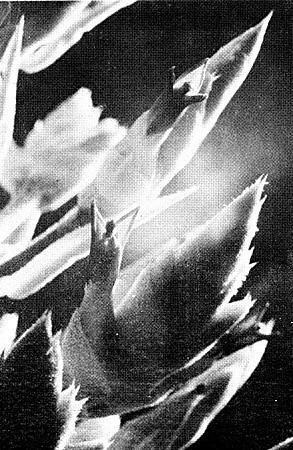 A note from Roger K. Taylor reads "In response to Mr. Drysdale's query (1964, #2, p. 29) on the use of calcium carbide to induce flowering of bromeliads, I have had some success with this material by adding a small fragment directly to the water in the leaf-cup, or by leaving a lump or two exposed to the air in an enclosure containing the plant for a 12—24 hour period. The treatment, however, didn't always work. "I have not used the technique of making up a solution to apply, but two possible reasons for failure occur to me. In the first place, calcium carbide is extremely reactive with water, either liquid or vapor, so that on exposure the hard dense lumps become coated with the loose powdery reaction product, mainly calcium hydroxide. If this is taken instead of the unreacted core, it is inert for liberation of acetylene. Secondly, there is a considerable heat evolution in the reaction; to minimize loss of acetylene from the solution, the water should be quite cold. The solution, furthermore, should be used with as little prior exposure to the air as possible"
OR INFORMATION AS TO HOW BROMELIADS FLOURISH, in the jungles of Central and South America, most of us have to turn to those who have visited such places. But one thing is sure, however, and that is that nature nourishes these wonderful plants on elements other than air and water and that if we are to get the ultimate out of our plants which have to live in a thousand different environments, we have to study how this can be done. With this in view, the writer set forth to carry out a program of research, of trial and error, of disappointment, and finally of delight. In cooperation with the Queensland Agricultural Department and the help of one officer in particular who is an expert on the subject of pineapples, I have been able to compile the following notes. The studies were not made with Ananas comosus alone, but with the whole family of bromeliads, for it has been found that as a family all bromeliads require the same care whether terrestrial or epiphytic. Briefly, we run through the matters of potting, which includes careful drainage, the inclusion of acid material of no less than Ph 5, of some porous material no matter what, and a pot large enough to permit feeding the plant. It does not matter whether the pot is plastic or clay, for bromeliads will thrive in open ground just as well as in any kind of pot. As for symptoms of trouble, and the cure for such, it will be noticed that in all cases the trouble is due to malnutrition. The problem of the inner leaves sticking tightly together, refusing to unwind and thereby forming a tight tube has in the past been put down to overwatering in cold weather. Actually this is, without a doubt, a deficiency of the trace elements copper and zinc, without which a bromeliad cannot prosper. Strangely enough we have been led to believe for years that these very things were not tolerated by broms. The deficiency is known as "crookneck" for obvious reasons. The next problem is perhaps more common. At some time or other most growers have had the older leaves of a plant die back from the tips, while the younger leaves are not affected. 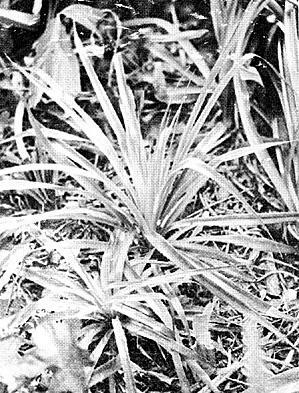 This shows a deficiency of potassium, an element necessary for the successful cultivation of bromeliads. Problem number three shows up at the growing point of the leaves, which show a yellowing—this is not true of the older leaves. This is known as iron chlorosis, a deficiency of iron reducing the intensity of the green coloration of the leaves. This characteristic usually serves to distinguish iron deficiency from nitrogen shortage, when the younger leaves usually show some green color, whereas the old leaves are chlorotic. The next problem is perhaps the most common of all. In every collection of broms, one will see the outer leaves on some plants drooping, kinking, weak, and listless, instead of being strong and upright. Here is the deficiency known as the wilts, and the-cause of this, as well as being a sign of general deficiency, is lack of acid, and a gradual plant decline is certain. An unusual feature of these troubles, and of crookneck in particular, is that some plants are badly affected while others, even those alongside, may show no abnormalities at all. No explanation can be given for this, except that perhaps some plants are more vigorous than others. It is fair to say that some pot may contain more decaying organic matter which would counteract deficiencies to some extent. Potassium is needed for the formation of carbohydrates (starches and sugar) within the tissues. These in turn determine the rate of plant growth, and without large quantities of this one element alone, plant structure will suffer. Lack of these foods also causes root failure and subsequent plant decline. Broms must have a dense root system for the vigor that is necessary for larger, healthier, and more productive plants. The main reason for research into these matters was to be able to rest assured that all plants sent out to hardier growing conditions would be able to "take it." Under ideal conditions, bromeliads will grow quite well although they will not always flower and produce as many suckers as they should, but when they come up against tough going, things start to happen that could have been avoided if the grower had sent out one hundred percent healthy plants. It is hoped that this article will not be discouraging to growers, but rather that it will assist them to "grow our Bromeliads better," as one writer to the Bulletin recently put it. Actually, the matter of rectifying all deficiencies is very simple. What is really necessary is that one has a complete fertilizer, ready mixed and soluble, and spray it regularly over the foliage and into the tanks of all bromeliads about once a week during the growing season and into the pot, mix about once a month to feed the root system. If a list of the elements contained in a mixture is not given on the label of the pack, the manufacturers should be consulted to be sure that all trace elements are included. Such a mixture is available in Australia, and there certainly are suitable fertilizers everywhere. One thing is very important at this point, and that only half the quantity given on the directions be used, as overdoing can injure the plants. If the results of such complete feeding are as wonderful as those we have experienced, it can bring only added joy and pleasure from your broms. — Mt. Tomah, Bilpin, N. S. W., Australia. "CHOOPONEE" — a small plant belonging to the Pineapple family from Southern Chili (sic) which produces a fruit useful for its refreshing lemon-like juice. Grows on the poorest dry rocky soils and is hardier than the Pineapple — standing quite heavy frosts without injury. One-year plants 1 each, 40c; five $1." During the intervening years the plant has slowly multiplied in Mrs. Swets' garden until there is a clump of twelve. There had been an increase of 30 to 40 plants over the years, but these petered out and died. Several of the plants had been given away or moved to various locations of varying exposures, but few survived transplanting. The present planting receives shade from a large walnut tree during the summer, but gets considerable sun in the winter. One plant moved to my garden has grown well and has now a sucker. It would be interesting to learn if other recipients of this plant still cultivate it after such a long period and whether they have had any luck getting it to flower. It is rather regrettable that as of now, at least, interest in the plant must remain academic because of its scarcity; but its virtues, even without inflorescence, are considerable. It has a graceful form with light green foliage armed with numerous small but sharp spines. It is, like many of the bromelaceae, neat in growth and strong in its rhythmic design. It can take a fair amount of sun, but is more attractive with filtered light and can withstand cold in excess of 25 degrees F., making it an amenable garden subject for southern California. Superficially, it resembles Fascicularia bicolor. As a ground cover "Chooponee" is nearly ideal, requiring virtually no renovation since the old leaves lie nearly flush with the ground. It obviously is not a sensational plant, but it has a quiet charm that endears it to the grower. A carbide solution was poured into the center of the plants, but since the heart does not form a tight cup, the solution was not retained for any length of time and no inflorescence was initiated. This bromeliad is an interesting link with the great Burbank and the early days in our garden. — 1200 Isabella, Riverside, California. 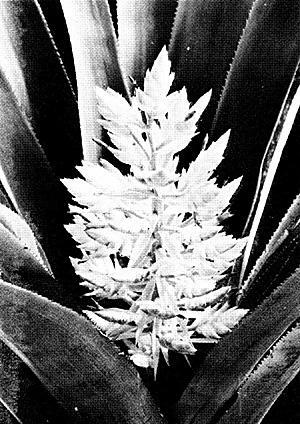 THE PICTURE ON THE COVER — This splendid photograph, taken by Dr. William Dunbar of Los Angeles, California, shows an intriguing variation in the growth habit of Vriesea × Mariae, for this plant not only produced one flower stalk from the center cup, but two others coming up between the leaves. When the plant was purchased from the California Jungle Gardens, it appeared to be no different from others of its kind; but it began to grow until it was larger than the average and then put out three inflorescences. It has been as generous with its offshoots, for over a dozen have been removed, and more are coming. These will be carefully watched to see whether they will produce multiple inflorescences. Dr. Dunbar gives his plants much water and much food. My apology goes to Mr. Charles Hodgson of Australia, who furnished the photograph, and to the many members of the Society, who called my attention to the fact that I had omitted to mention the picture on the cover for the last issue (May—June, 1964) in the Bulletin. The picture shows Aechmea miniata growing with other plants in a blue container. Aechmea miniata makes a handsome specimen in the house, as it is very hardy and stays in color for many months. Even when not in flower, it is very attractive because of its colorful foliage. 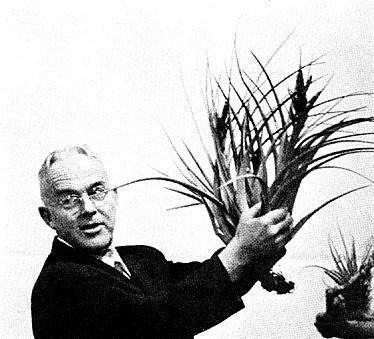 HE ABOVE PHOTOGRAPH shows Dr. Lyman B. Smith, of the Smithsonian Institution, as he appeared at a recent lecture given before the Greater New York Chapter of the Bromeliad Society. This group is to be congratulated for the excellence of their programs, which are held on the first Tuesday of each month at eight o'clock in the evening in the library of the New York Horticultural Society, 157 West 58th Street, New York City. Also to be commended is its president, Dr. George Milstein, who staged a splendid bromeliad exhibit at the recent flower show and for which he won special awards. More than fifty members of the Florida West Coast Bromeliad Society were guests recently of the Holmes Nursery in Tampa, Florida, where they could not only study individual plants but see their use to enhance landscape effects. This group was responsible for the all bromeliad flower show held in Clearwater in April. More about this will appear in the next issue of the Bulletin. The Bromeliad Society of La Ballona Valley was entertained recently by a showing of film taken on the last Kubisch expedition to Mexico. Meetings are held on the fourth Wednesday evening of every other month, starting with January in the Veterans Memorial Building in Culver City and are open to all interested persons. 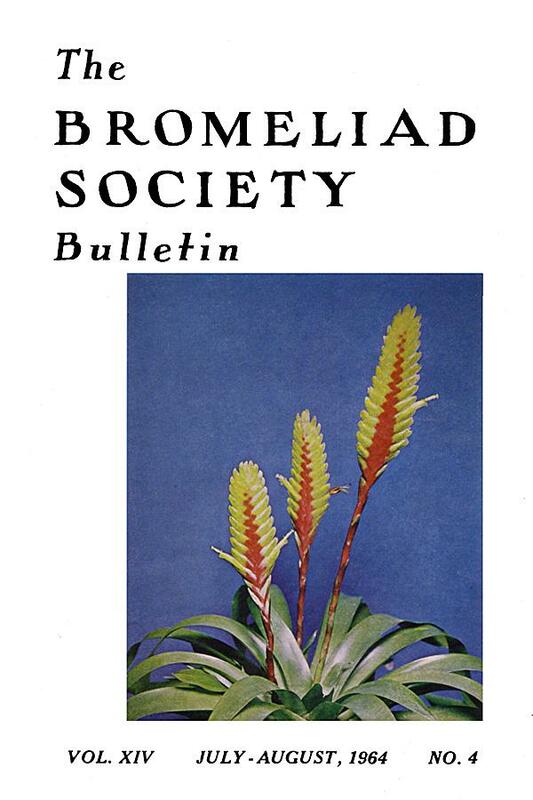 The Bromeliad Society, under its president, Mr. S. Booth, is certainly moving ahead rapidly. Its Bromeletter is a splendid little magazine and helps to unite the large membership, now numbering 116. Its entry in the Royal Agricultural Show in Sydney last spring won for it the admiration of thousands as well as the "Special Merit" award. "You would be surprised, we have rules, just as a society in your city would have; we grow and study bromeliads, we talk plants and history, we visit, we give and exchange ideas, some times seeds and what nots, we are a closely knit bunch in both Robins. I do not accept as a member any person who can join a society in his or her own vicinity. I will tell you a secret — I would not change places for any office in any society, I have my Bromeliad Robins, and I sincerely hope they can say the same thing about their director." Mrs. Allen's address is 6814 Tenth Street, Tampa Florida, 33604. If you are interested in an exciting experience, write her. S ALL GROWERS OF BROMELIADS KNOW, the most important methods of increasing one's stock is from the offsets that form on mature plants. Broms in many places, such as in New Zealand, are still in short supply, so that offsets serve as a means of exchange and as a way of getting greater variety in one's collection. Then, too, offsets removed from the old plant make much better formal shaped plants than those left on, which frequently become lopsided. Also, plants grown in fresh compost, though sometimes slower to start, frequently make better plants than those grown in old stale soil mix. For obtaining the largest possible number of strong pups, flowered plants should be as well treated as those still growing. If there is room enough, they should be kept on the bench with good light and ventilation and given an occasional feeding. If the house is crowded, many tender varieties can be placed outside in partial shade during the summer months. Strong plants will often give two or three or more pups at a time and will continue to do so for three or four years. I have an old Neoregelia carolinae with only three leaves left on it. I have had four pups from it, and it is still producing more. The sooner pups are removed, the sooner more will form. I usually wait until new roots are beginning to form on the offset before removing it. If taken too early, the offset will be soft and likely to rot. It is best to wait until the offset has two or three leaves of reasonable size. Spring is the best time of the year to break up old plants for those growers with limited facilities, though this can be done through most of the year provided climatic or glasshouse conditions are adequate. With warm weather coming on, offsets will root readily, and the old plants will sooner throw new shoots. If no heat is available, it is better to leave small offsets on the plant from late autumn to spring. If there is a hot-pit, the offsets may be stood in this for a week or two till they are rooted. If there is no heat, the plant should be potted, although it will take root more slowly. Some offsets are easy to remove with the help of a knife or by careful pulling. Some, such as Nidularium fulgens, are hard to detach, as they are tight against the old plant. A small sharp knife and careful handling should do the job. Some plants, such as Tillandsia lindenii, divide from the center. It is better to leave these for a year or so when the new divisions will have developed trunks and thus be easier to separate. Others, such as Tillandsia viridifolia, produce tiny offsets around the base; these are best removed, as on the old plant they are not likely to develop into anything larger. Incidentally, flowered plants are of more use to a nurseryman than are unflowered ones, as the flowered plants will give him offsets in a short time whereas with an unflowered plant he may have to wait up to two years before getting any profit. — 901 Mt. Eden Rd., Auckland, New Zealand.